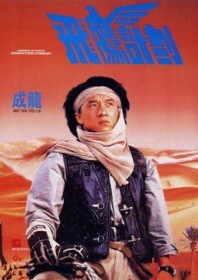 Conceived as a sequel to Jackie Chan’s most successful picture, this flies off to Spain and quickly hotfoots to the Sahara in pursuit of a secret stash of WW2 treasure. As gadget whiz Asian Hawk, Jackie is assisted in his troubles by three airheads recruited to attract crucial overseas markets: a Chinese historian (Cheng), a German heiress (Coba) and a Japanese ethnologist (Ikeda). The set pieces are as spectacular as you would expect (a neat homage to Buster Keaton’s Steamboat Bill, Jr. pitting Jackie, Vincent Lyn and Ken Lo against each other in a wind tunnel, plus a corker of a car chase), but the intervening filler shows signs of desperation. Part of the trouble is that anything goes, resulting in extended comedy brawling involving the crass female triumvirate, spared only by the unrelenting charm of the film’s star. It is clear this one was destined for an international audience, starring a mostly Caucasian cast and profiting from a huge blockbuster budget unheard of for a movie of this kind (HK$90million, to be precise). The pennies are evidently up there on the screen: the locations shine, the sets extravagant, and the action is wild, yet the story convolutes and gets out of hand, eventually involving a wheelchair-bound Nazi and some Africans who also want their share of the treasure. The thrills are there, and although this is a case of style over substance, the overall experience is more fulfilling than the first.